We are experiencing an issue trying to install the 1607 Feature Update using a Windows 10 Servicing Plan in ConfigMgr CB (5.0.8412.1000). We have a simple single server SCCM infrastructure. 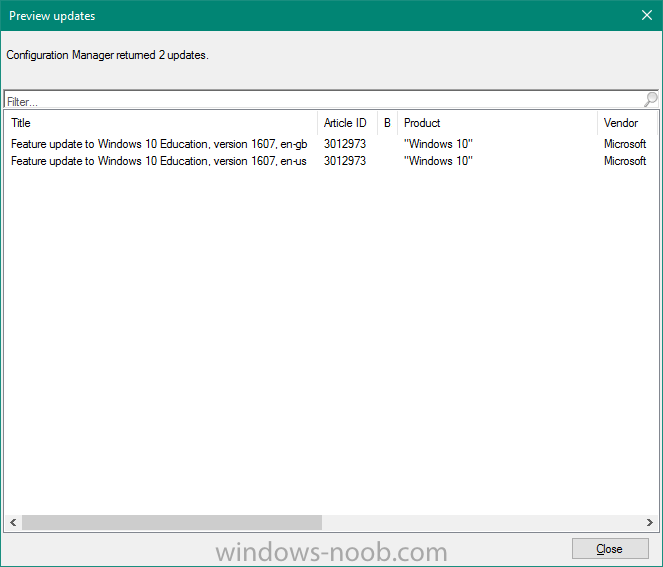 The required KB3159706 has been installed on the server, and the additional steps in "More information" at the bottom of that KB article have also been carried out. We've cleared the download of the Feature Update and downloaded it again after verifying the steps. Both the WSUS site and the Configuration Manager site in IIS have the .esd mimetype set to application/vnd.ms-cab-compressed. The deployment appears on clients (5.00.8412.1007 CCM client), and downloads the 2 GB or so judging by the time taken, but fails to apply. We never get to reboot into the WinPE(?) stage to perform the upgrade. 2016-08-22 22:08:11, Info                  MOUPG  DlpTask: Resetting action  progress start time. 2016-08-22 22:08:11, Error                 MOUPG  RecoverCrypto: File is encrypted, but no key was provided. 2016-08-22 22:08:12, Info                  MOUPG  Waiting for actions thread to exit. 2016-08-22 22:08:12, Info                  MOUPG  Actions thread has exited. 2016-08-22 22:08:12, Info                  MOUPG  SetupManager::OpenOrCreateTask: Found task [Exit] in state [0x6] - Action [0xFFFFFFFF]. 2016-08-22 22:08:13, Info                  MOUPG  SetupManager::OpenOrCreateTask: Creating new task [Exit]. 2016-08-22 22:08:13, Info                  MOUPG  DlpTask: Transport not set. Skipping download phase. Even after clearing the CCM client cache, SoftwareDistribution folder, deleting the software update package from the CCM server and downloading and deploying it again, we see this issue across each of the several systems we have tried. Any further insights would be greatly appreciated! Is there anywhere else we should be looking on the server to do with decrypting the .esd? hi Peter, can you zip up all the logs (*.xml files, *.log) in that folder and send them to me to look at please ? 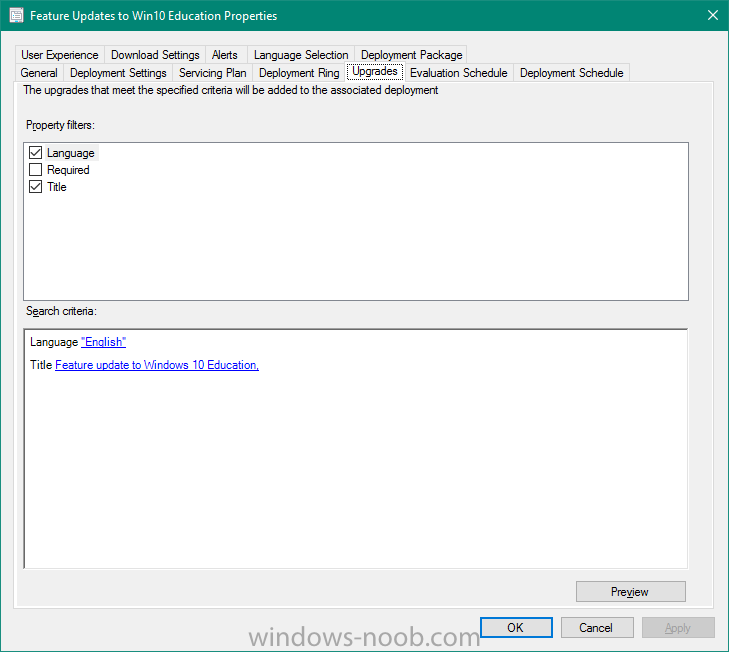 Indeed: our deployment is for the Feature Update to Windows 10 Education 1607. The en-us and en-gb versions of that SKU are the only upgrades downloaded. Our machines believe they are on en-us language pack(?) (although we have UK regional settings). ok try deleting the 1607 updates (all of them) in WSUS (the wsus console), then resync the sup in ConfigMgr, and try again. to fix the issue, you need to re-install the SUP. not according to Microsoft you don't, where did you get the idea that you need to reinstall the SUP ? Ran a Synchronize Software Updates from Software Library > All Software Updates in the SCCM console. 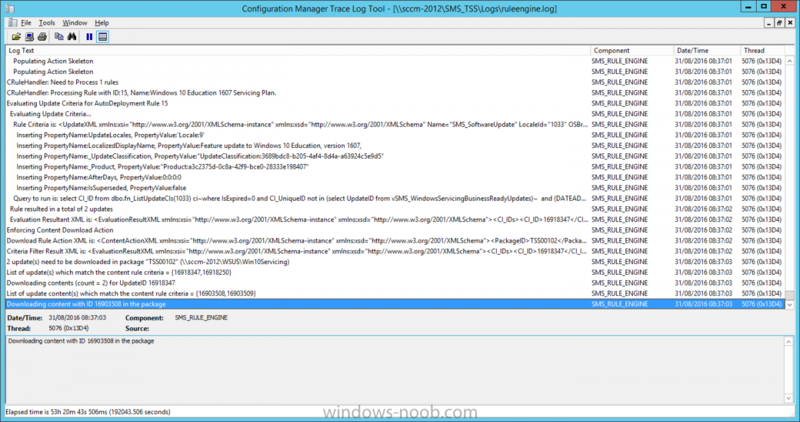 Verified that the Upgrades category is off in both SCCM console and WSUS. 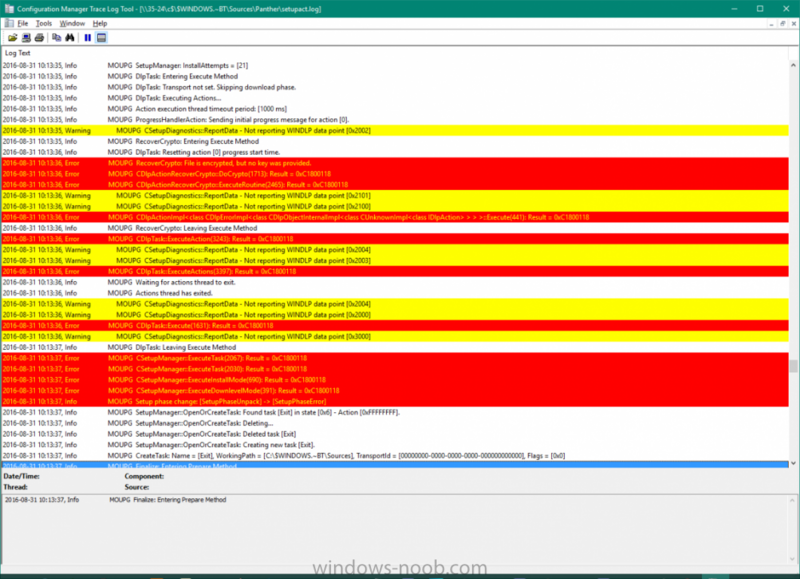 Ran the WSUS Server Cleanup Wizard with only "unneeded update files" checked. 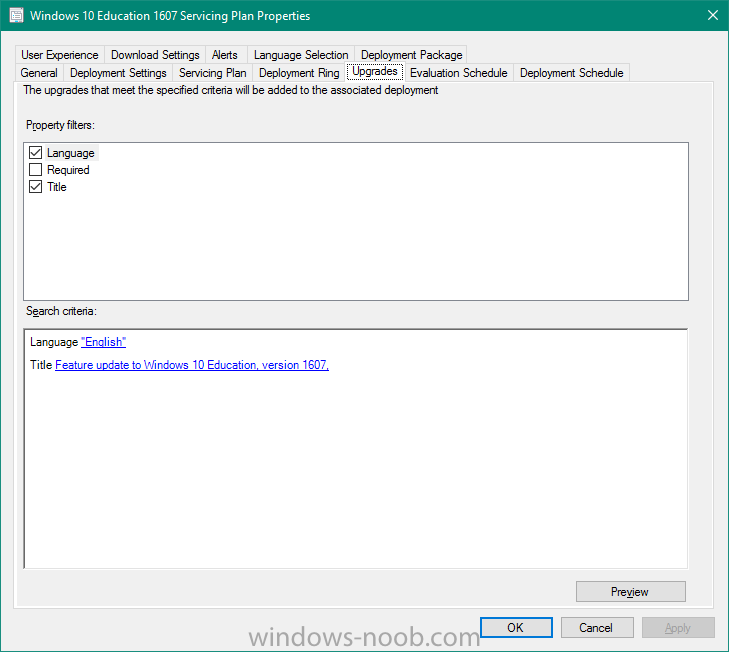 Created a new servicing plan "Windows 10 Education 1607 Servicing Plan". It uses a new deployment package. Clicked Run now on this new Servicing Plan. Got impatient and ran a Software Update point synchronisation to try and get the deployment to appear. Went to Software Center > Updates > Windows 10 Feature Update... and ran the upgrade. We still see the same error on the client after the download and install attempt. Really trying to avoid a SUP reinstall if possible! I had some other issues...recorded in a different post. Having said that, I have finally reached this error message and this point in my troubleshooting. From a Social.TechNet discussion, I have also come to the conclusion that I need to reinstall the SUP. I really don't want to have to do it...but there is compelling reason to believe it will work (knowing that I have tried all the other options). Back when my SCCM environment was smaller and unused for production, I remember having to do the remove and add the sup role and it fixed the problem that day. I'm not sure what gotchas and/or side-effects are involved now. I know you basically remove the roll. Watch the sup log till its done. Reboot?. Then Add the role back in and configure it as you had it configured before. What I don't know is...what else needs done (or re-done). How will doing this effect the existing software updates, groups, packages etc. Have you made any progress on this? I've seen various Technet threads discussing this problem, but no one seems to have a good answer. I'm running into the same issue myself and was hoping to have a working solution in place by Monday. I hope we won't have to go through this every single time there's a point release... WaaS seems a bit more fiddly than I was expecting! Cool! We just upgraded at the weekend and I was looking forward to trying this out! Going through this today. It at least has a new step not previously published. Fingers crossed. Yes, this support article worked. I had previously done all of the steps mentioned in the article, except for this one listed below. The install process then proceeded, with Software Center then requesting a restart. The test client system then restarted into the WinPE part of the upgrade process (what formerly was the "Donut of Destiny" screen). Trying to resolve this issue on a 2012 r2 server with a built in sql database. Do I complete the same steps? You sir are a legend! Just signed up to say thank you for saving me! Was about to uninstall everything as other websites suggest! @superhl - I use the built in database, yep you do those same steps on the database! Just tried this in my environment. Got 1607 working on at least 1 laptop so far, going to try mine at somepoint. Thank you for the excellent documentation! Excellent, followed hybrid's steps, all is working. I've followed the steps @hybrid suggested, but my goal is to update from Windows 10 1607 to 1703. The update is still failing with the same error 0xC1800118.